It’s been a while since I last posted as I have been settling back in to a “normal” work and life routine, healing up and cheering my wife Stef on as she became an official iron(wo)man at Lake Placid this year. Wanted to share this bit of news with you folks who so generously supported my cause this year. 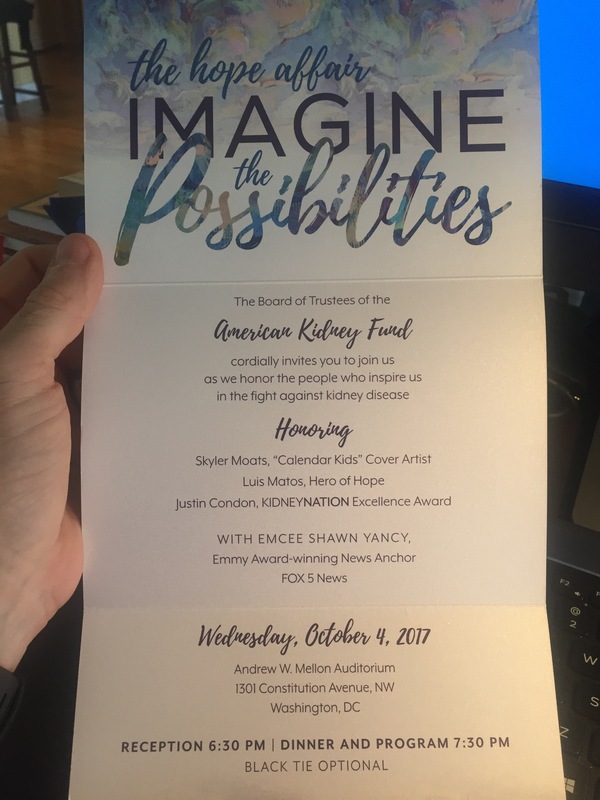 The American Kidney fund host their annual charity gala down in D.C. and this year is entitled “The Hope Affair”. I am delighted and humbled to be included in the list of honorees this year – although as I’ve always maintained, it’s really the generosity of you, the donors that should be honored. So thank you, again for rallying around such a great cause. Of course, I have to give a small speech and have been reviewing my previous work on fox5dc… noticed that I have one hell of a “resting bitchface” (always said I had a face for radio), so I’ll need to work on that probably more than my wordsmithing before then. I’ll give an update – and may even have a separate video clip of interest next month. Hope this note finds you all well. Ok I have no clue what a resting bface is …but anyhow….glad all well…ur Dad would be thrilled with what u ve accomplished (he already was anyhow)….well done. Must run…baby yelling…omg having bad day!! Night! Slán! !